At AppleInsider, we've reviewed a number of routers and mesh Wi-Fi systems trying to find the best ones after Apple discontinued the Airport and Airport Express. 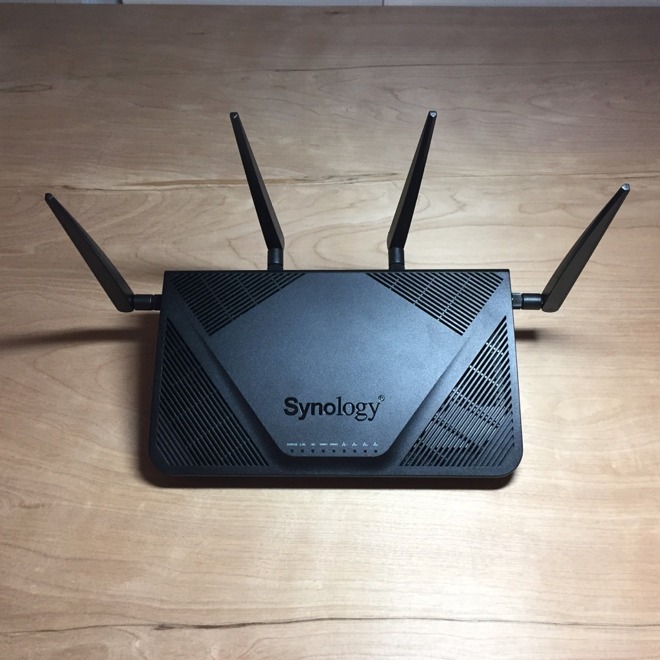 Right now, the Synology RT2600ac is our favorite for a stand-alone router. Networking hardware is far, far more than the sum of its parts. For instance, on the box, the Synology RT2600AC looks like nearly every other router. It's got four Gigabit Ethernet ports in addition to the WAN port. It provides 2.4GHz and 5GHz networks with 802.11ac speeds of up to 800Mbps and 1.73Gbps respectively, it has a few USB ports for storage and peripheral sharing. And, as a nicety, it has a SD card reader —but more on all that in a bit. These specs look great out-of-the-box, but we've seen similar before, and it hasn't been good. But, we're just going to stay this straight away —the $199 Synology RT2600ac router delivers strong Wi-Fi rivaling mesh systems we've installed. The 4x4 MIMO antenna and the router hardware is able to combine the 2.4GHz and 5GHz radios under the same network name and let devices join the radio that delivers the best signal. Almost every esoteric option you could wish for in regards to network settings is available —and this turns out to be great, instead of just being a confusing jumble of features. Synology, historically speaking, isn't a consumer router company. Their history is in making network attached storage, or NAS products. 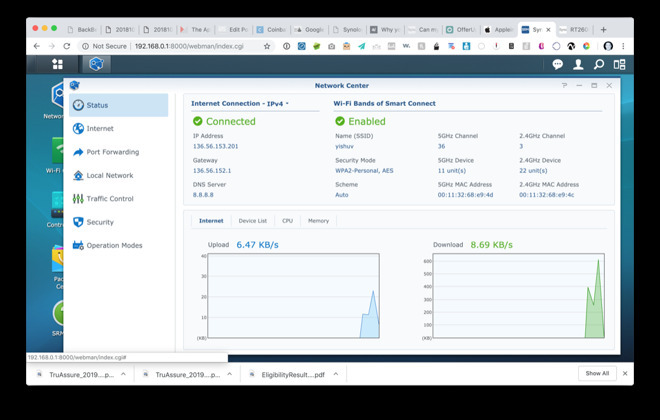 Here, they've modified the operating system they ship on their NAS products, added network interfaces for routing, and made something super-flexible, appropriate as a gateway for home or small business. 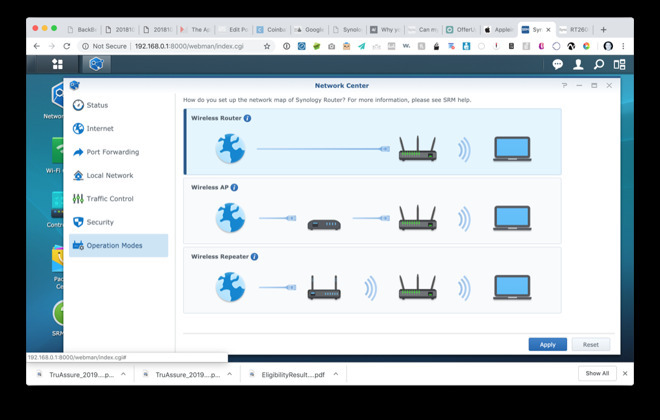 Many recent routers attempt to make things easy by providing setup wizards, basic and advanced modes, or they strip out features, or make setup possible from a mobile phone app only —and Synology hasn't gone that way. Synology's RT2600ac does work with the company's DS Router mobile app which makes initial setup easy. After setup, this app is more for monitoring connections and making a few small configuration changes, or scheduling hours when devices can have access to the Internet. 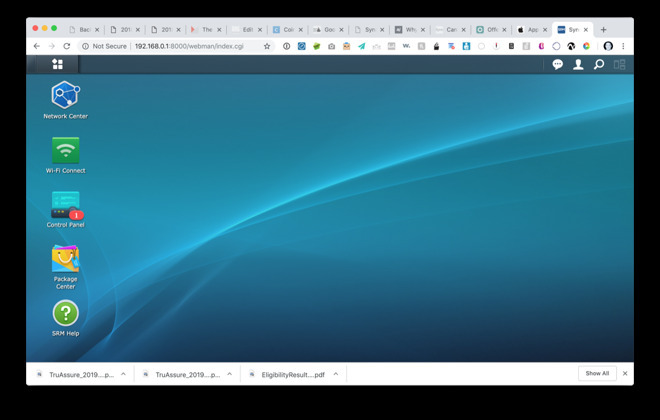 The greater flexibility in configuration is done via the browser —a welcome return to "standards." 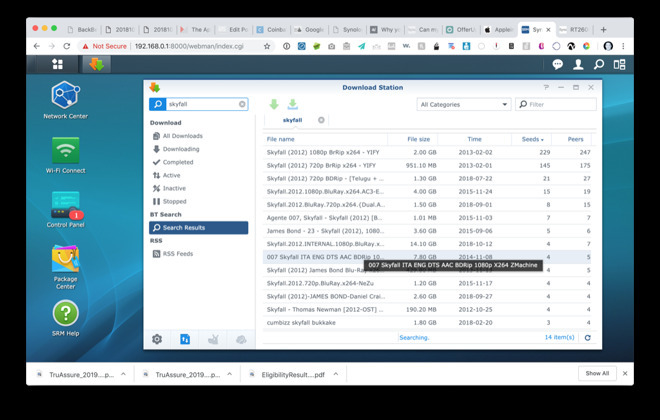 The interface for the Synology RT2600ac, just like the NAS products, looks like a desktop operating system that just happens to be running in the browser. It has it's own menu bar, desktop icons, and even a light App Store, called Package Center. 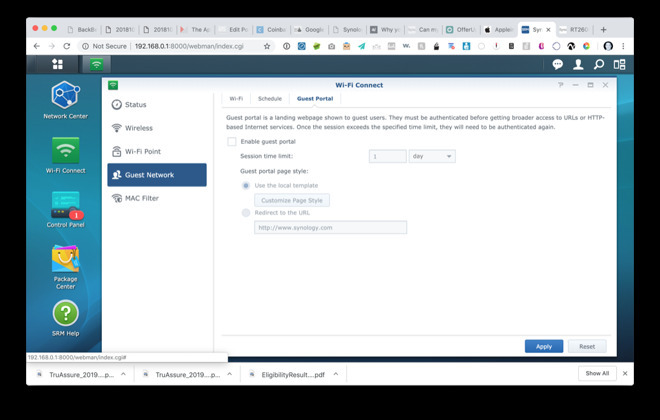 This can be a little daunting if you've never set up a network connection without the help of a setup wizard, but it's not difficult once you get the hang of it. Network configuration is done in the sensibly named "Network Center." 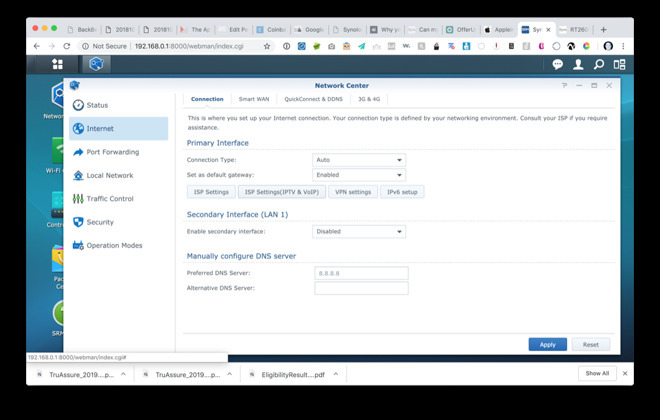 Here, you can configure the wyour Internet connection from your ISP —your "wide-area network" — whether that's just DHCP like you'd use with a cable provider, PPPoE like you'd get from some DSL providers, DS-Lite (dual stack, IPv4 packets encapsulated in IPv6), configure your local network, port forwarding, quality of service, security, and operation modes. It's possible to set the router as an access point, too. An application named "Wi-Fi Connect" controls some of the same settings as in Network Center, but it's here that settings like scheduling a guest network, or setting up a mesh point system can be done. It also allows you to set up a captive portal for a guest network. Like we said, the Synology RT2600ac has a USB3.0 port, a USB2.0 port, and an SD card reader compatible with SDXC and SDHC. You can connect storage devices and use them for file sharing in a sort of network-attached-storage-lite way, connect a printer, and even set that printer up as a Google Cloud Printer. When you connect a storage device, you can use it with the DS File mobile app, via the web browser, or FTP/SFTP. 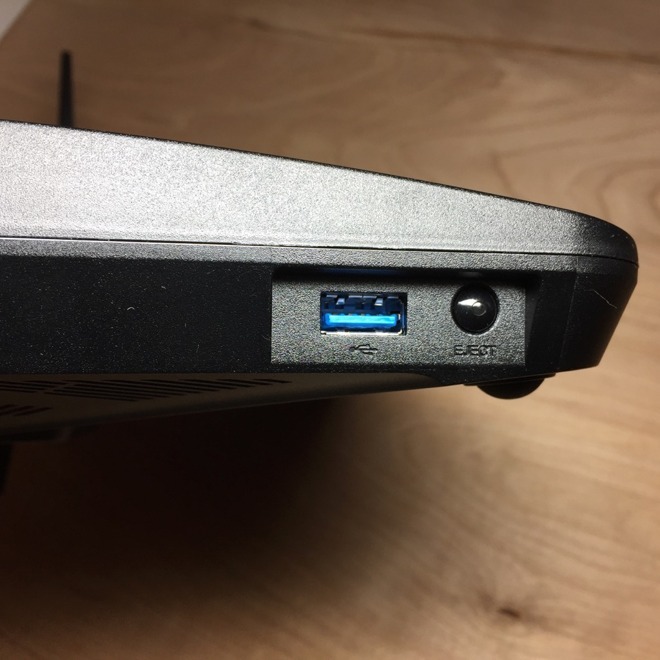 The USB 3.0 port can be set to have slower speeds so as to not impact Wi-Fi. For those of us who miss the Apple Time Capsule, Synology lets you use the connected storage for Time Machine backups by checking a box in the "Control Panel" application under File Services. There's a checkbox for Bonjour Printer Services as well, which will advertise the USB-connected printer to the Mac —but it lacks AirPrint services. In the "Package Center" application, it's possible to download a few extensions to the router's functionality. Media Center turns the router into a DLNA server, which will let it serve media to a PS3, PS4, Xbox 360, Xbox One or Samsung TV. This is a little less interesting to us as Apple TV fans unless you've invested in a DLNA app, but it's there if you have one of these other devices and want to play files to the TV. Another application in the Package Center is Download Station. Download Station supports BitTorrent, HTTP, FTP, NZB, QQDL and eMule. 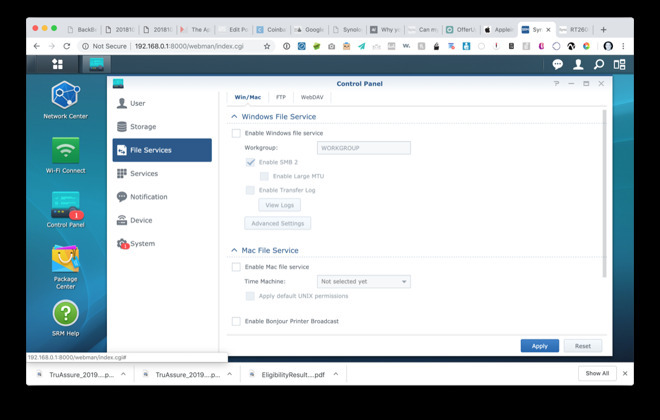 If you enter a search term and select a file, it will download it to the connected storage, allowing for a local, and self-hosted cloud setup. There's a search field to search for files from BT trackers, and It's also possible to add an RSS feed containing links and have the router download all the files in the feed. It's interesting that Synology choose to include this application. Also in the Package Center are networking applications. Threat Prevention is intended to prevent the router from infection and data compromise, with Safe Access adding parental controls, web filters, and time quotas. 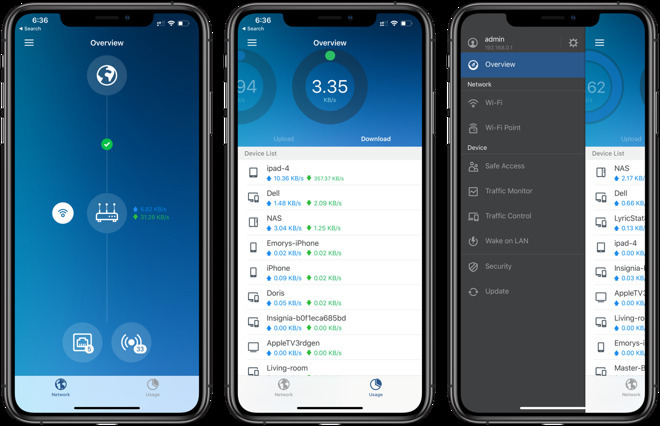 The highlight of all this is the VPN Plus Server application allowing use of WebVPN or a client application to access the server through a wide range of protocols, including SSL VPN, Remote Desktop, SSTP, OpenVPN, L2TP/IPsec, PPTP, and site to site. On the back of the RT2600ac is the WAN1 port, USB 2.0, and the four port gigabit switch. The router has the ability to turn the first port of the LAN 4 port gigabit switch into a secondary WAN port for multihoming across two ISPs. If you had Internet service from both a cable and a DSL provider, for example, you could connect them both and have the router set to failover gracefully should one of the two connections fail. Or, you could use one of the USB ports with a 3G/4G LTE modem and use that for failover service. 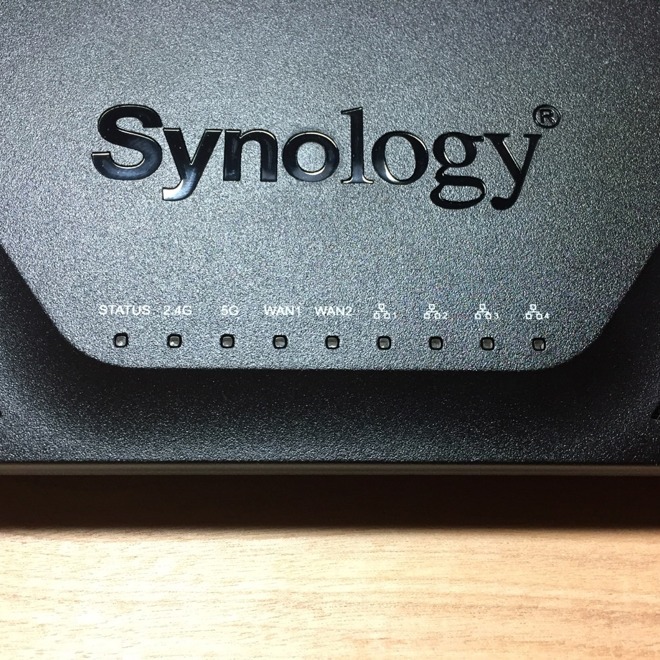 The Synology RT2600ac is one of the most flexible routers we've seen. It isn't always the easiest to configure for some strange edge case uses, but nearly every option seems to be present. 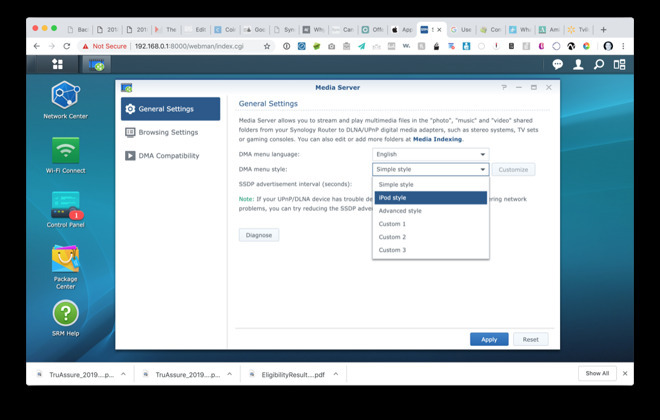 We used the IPTV settings Synology provides to configure the WAN port on VLAN 2 with medium priority for Quality of Service (QoS), and were able to replace the network box modem our Internet service provider requires. 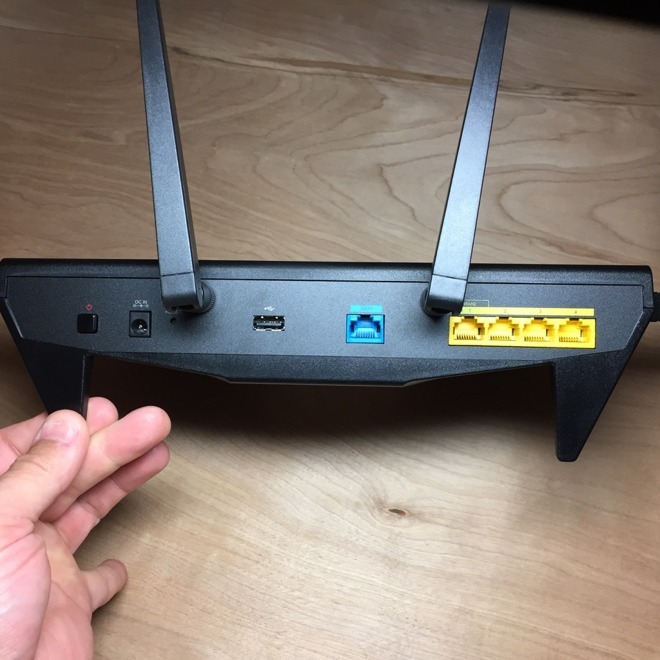 We were able to connect the router directly to the fiber jack, something other routers haven't been able to do without another device in the middle. Admittedly, this is very esoteric and specific to our ISP, but it shows just how adaptable the Synology RT2600ac is to a wide range of situations. The mobile app is pretty flexible, too. We have a few wishes and comments. It's great that the Mac printer sharing feature supports Bonjour. We wish it also supported AirPrint for iOS devices. We wish that it included a version of Video Station, the application Synology includes on their NAS products, which works with their DS Video app on AppleTV and iOS devices. That would be so much better than DLNA. Lastly, when the device needs a reboot, it can take up to a full 10 minutes to shut down orderly and come back to life. From a cold power on, it takes at least 4 minutes for it to be ready. This is not a fast booting router, but once it's booted, it's excellent. The Synology RT2600ac has great range and Wi-Fi performance. 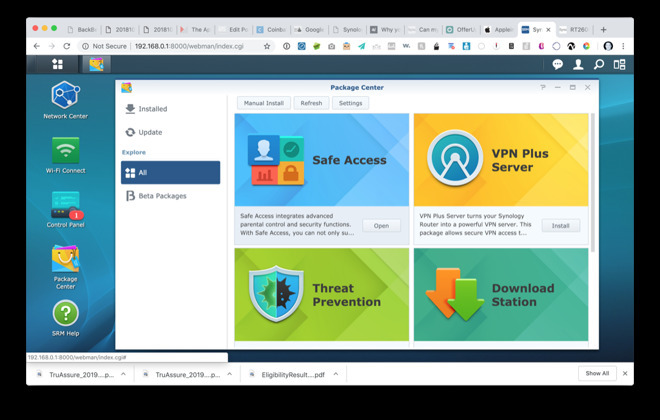 It has a small number of applications in its Package Center to enhance features, and it covers everything from parental controls and threat prevention to downloading files, acting as a light NAS, and a VPN server. It's relatively easy to set up, and doesn't take away advanced user's options by taking away features. There's a lot to like here, and it is our favorite AirPort replacement router so far. Score: 5 out of 5. The Synology RT2600ac is available for $199.99 at both Amazon and B&H Photo, the latter offering free expedited shipping within the contiguous U.S. for all shoppers.